The other week I happened to be at the Nürburgring (probably the only time I’ll ever get to “happen to be” at the greatest race track on earth) and the Eifel Rallye Festival was going on nearby, so over I went to see it. The whole event was wild, which I should have anticipated from the parking lot alone. I wrote up a whole thing on what it was like at the rally here, but basically in America attending a rally is an act of great dedication. In Europe it’s just a thing that happens in your town once every so often. Not that it doesn’t bring in the dedicated enthusiasts. The cars in the parking lot were wild. Fellow journalist Dan Trent and I rolled up to the big grass lot and parked right by what I thought was an NSU TT but then quickly realized was a similar Simca 1000. These were little post-Corvair rear-engine economy cars from France with minute little 1000 cc engines that had a bit of a sporty career in racing. This is very much like my platonic ideal of what a small, European sporty car should be. Blacked out hood, rally lights, lots of attitude. It loomed over the little flowers and not much else. These cars are tiny. The whole lot was full of cars like this. Just beside it was that racy Saab 900, and just behind it was a caged first-gen VW Golf on gold meshies. And with the yellow mirrors was a very tantalizing piece of forbidden fruit to this American: a Renaultsport Clio. I have read too many copies of EVO not to want one of these with a passion. Hot hatchbacks are increasingly common in the States, but I still miss not getting these things. Also small and sporty was this Se7en of some kind riding on a set of wheels I didn’t recognize at first. Later I looked them up as Schmidt THs, not your usual Ronal Turbos or any other ‘80s aero wheel. There was tons more in the lot but what caught my eye before we had to go was this group of absolute rally heroes. Not a lot of grass lots in America casually have a Ford RS200 hanging out in there. This wasn’t even the rally itself! This was just people coming to check it out. I’m going to assume that this RS200 is a replica. I hope it is. 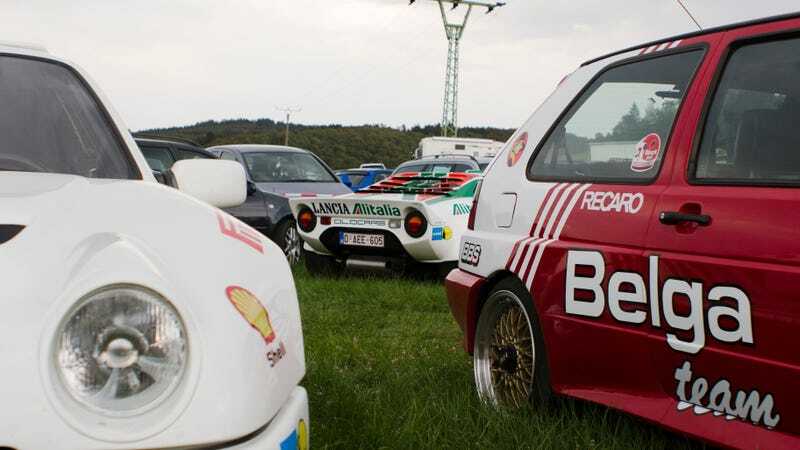 I can’t live in a world where a regular RS200 shows up to a historic rally just for lols. It’s so clean. It’s too clean. Please. Also lovely was this MkII Golf, which I assume rolled up with the RS200 as they were both Belgian. The Belga Rallye team has been around for a while and I don’t know if this is a replica or a real deal rally car. I’m going to go with replica. Please. I hope. I can’t handle this parking lot. Just behind them was a Stratos. Please, again, be a replica. I can’t. Oh god. I can’t. I never want to see any parking lot again. I am overwhelmed. Why Rallying in Europe Is So Much Easier Than in the U.S.